The 1993 Harold Ramis film Groundhog Day, starring Bill Murray, is a guilty pleasure of mine. I have probably seen it a half-dozen times. 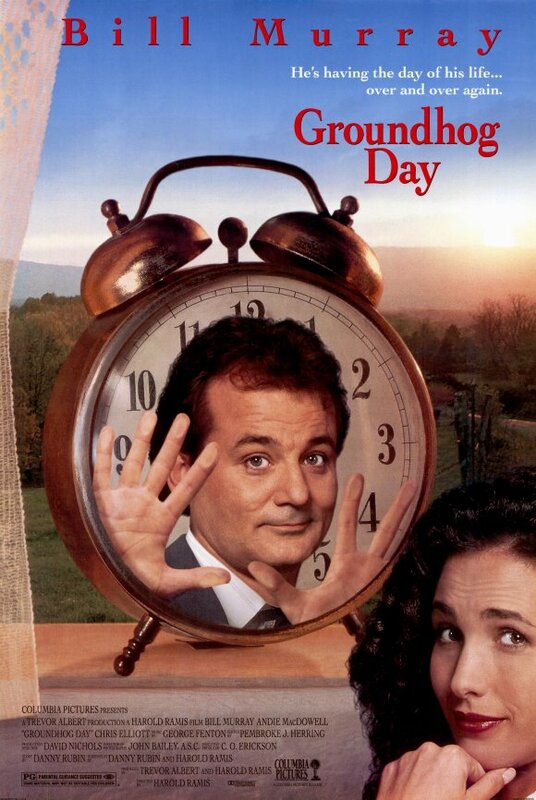 The movie features Murray as a self-centered meteorologist in a perpetual time-loop reliving February 2nd and the coverage of Groundhog Day in Punxsutawney, Pennsylvania. Murray tries various ways to break the loop, but regardless of whatever he tries, he finds himself waking up on to the radio alarm flashing the date of February 2nd and playing I Got You Babe by Sonny & Cher. Over the course of the movie, as Murray lives the day over and learns more about how the day unfolds, he takes better advantage of this knowledge to improve himself and help as many people as possible around the town. The movie’s ‘feel good’ ending sees the loop broken when he awakes on February 3rd having won the heart of leading lady, Andie MacDowell. So, just what does this have to do with education? Sometimes I feel a bit like we are stuck in the Groundhog Day loop. The scene plays out something like this: we wake up the Tuesday morning after Labour Day with I Got You Babe playing in the background, and travel through the excitement of September, the gray and toil of November, the budget angst of March and the celebration and excitement of June only to go to sleep on June 30th, waking up on the Tuesday after Labour Day to do it all over again. And we treat our work a bit like Murray treats the day — we try to do last year over, hopefully a little better, hopefully a little smarter for the experience. We try to see the problems before they happen and to be better at our craft. The challenge, unlike in the movie where all the characters are the same and it is only Murray that is different, is that our world and our students’ world are rapidly changing. So, simply repeating last year a little better is not good enough. And, as easy as it seems to try to do last year over again, and next year just slightly better, this simply does not recognize the dramatic shifts that are occurring in our world. Not only do we have to do last year over better (a focus on improvement), we also have to try to do it differently to meet the changing needs of our students (a focus on innovation). I am reminded of something I have heard at several professional learning events — we want to teach for 25 years, not for one year, repeated 25 times. As we put the final wraps on another school year, I am beginning to think about how next year will be both better and different, and I Got You Babe will not be the first song I hear as I head back to school in September.